At the end of deliveries of Block 2, additional 50 aircraft Block 3 may be purchased from Pakistan Air Force. The first dual-seat JF-17B fighter jet is expected by the end of the second quarter of 2017. 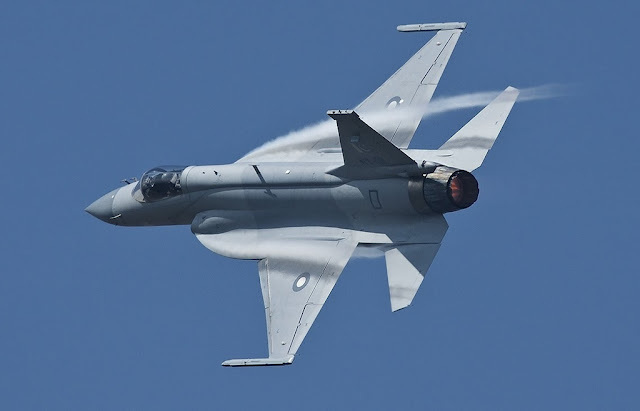 Air Marshal (PM) Arshad Malik, the chairman of the PAC, he told asianmilitaryreview.com: "These are very exciting times for a fighter jet that will help to shape the future of Pakistan Air Force (PAF). " AM Malik said that 2016 was a busy year, 16 fighters have been completed and are due for delivery in the current year. In 2017, the CAP will build 14 JF-17 single-seat to complete the batch of 50 Block 2 aircraft already ordered, the production began in December 2013: "We can increase our production even more to satisfy future exports, "AM Malik added. On the export side, the Nigerian media have recently announced that the Nigerian Air Force already ordered three JF-17 (As well as Super Tucano), but further details are not known. Initially, three JF-17Bs will be built, two of which equip the PAF. The two-seater version will speed up the integration of more weapons according to the CATIC (China National Aero-Technology Import and Export Corporation) which offers the aircraft in its portfolio. At the same time, it will allow potential customers tanks to the live testing opportunity instead of the simulator. Meanwhile, a contract for 50 JF-17 Block-3 should be signed in the first half of this year, which will ensure a non-stop production after the completion of JF-17 Block-2. The most advanced version of Thunder will include new avionics, improved electronic warfare systems, a higher load capacity and more sophisticated weapons.